This Power Cat is in excellent condition with some minor paint work needed on the top side hull. Brand new cockpit interior, floor, dash and all seating looking brand new. Engine room is spotless. The trailer is a great condition with low tire tread wear. Stock #162429 WOW. NOR-TECH 3600 Super Cat with Twin Cobra Power 1000 HP Engines with just 30 HRS! If you are in the market for a high performance boat, look no further than this 2008 Nor-Tech 3600 Super Cat, priced right at $165,000 (offers encouraged). This vessel is located in Miami, Florida and is in great condition. She is also equipped with twin Cobra engines that have only 30 hours. 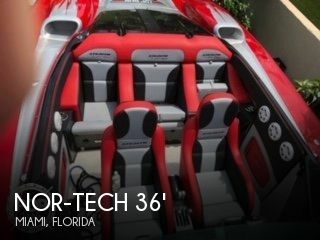 2008 Nor-Tech 3600 Supercat Hang On to Hall Pass if you can...It's a Poker runs dream machine that needs nothing!Nor-Tech builds one of the finest and most predictable Super Cats on the market today and HALL PASS is no exception. She is powered with the very reliable Mercury Racing 1050's and will set you back in the seats at 160MPH while providing a stable, dry and predictable ride. Make no mistake about it, this Super Cat Like New... Nortech's best paint to date. LOW! LOW! Total hours! 9 hours on Completely Rebuilt MERCURY 1075's by Mark Boos @ Precision Marine. Rebuilt Bams! 29 hrs on Complete rebuilt #6's by Vern @ West Coast Drives. That's $87,000 in Rebuilds to make her ready for more trouble free boating. Bonus! New CMI Big Tube Headers to compliment new motors! Just replaced Navi Star with a New Garmin GPS. Replaced the Head unit, Remote and all amps (JL) this past summer. 4 seater + rear bench with straps. Nortech swim platform. Great for hanging out and docking... Mostly fresh water use... with exception of major events. Original owner kept her in Canada.... All fresh. So nice she was featured in a Pit Bull / Jay Sean Video! Some serious performance here.